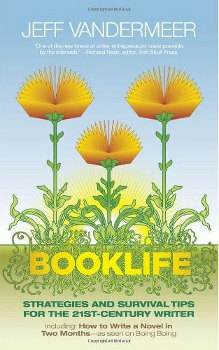 Hyperprolific author and anthologist Jeff VanderMeer recently completed and submitted Booklife, a non-fiction book about the writing life that promises to be full of insight, harsh truths, good ideas and (knowing VanderMeer) dark humour. He’s been posting a few excerpts from it in various places, including a chunk of tips on PR and self-publicity for writers which are well worth reading even if you’re not a writer – they say a lot about the art of publicity in a world where everyone is already their own PR firm (whether they realise it or not). How did some of these people arrive at bad places? Horrible advice. Always keep in mind that advice, especially advice on promoting yourself, is often anecdotal or a Received Idea–received from a time machine from the Distant Past. Sincerely-given but idiotic career advice can be a shiv in the side, an icepick through the eye. Worse, it can result in a slow malarial fever from which you never recover, performing actions you later have no good rationale for doing. The worst career advice attempts to separate you from your work, you a shucked oyster wondering what happened, and why.